Running a restaurant can be a lot of work. Being that there is no shortage of hungry people, a restaurant will always have its customers. Partly to do with this is the menu for having a good or bad menu can be telling of how good a restaurant is. You may also see menu card templates. Crafting an excellent menu can be hard to pin down. However, if one does nail a perfect restaurant menu, they will be rewarded handsomely for it is in a menu that one can tell the restaurant’s identity. That little booklet not only the food items available in a restaurant and their prices, they also hold the ambiance, theme, and style of the establishment. Most restaurants have a multi-course meal as their menu while others serve their food à la carte. Serving a food as à la carte or ala carte means to serve it individually or just as is. This is a good practice as sometimes restaurant guests and customers do not really have either enough time to run through a multi-course meal or a table d’hôte or they just want to order all appetizers and starters as their meal. Having an ala carte menu means giving the customers more flexibility in how they choose their food. With an ala carte menu, you can server starters, main course or other food categories individually. Starters are small dishes served before a meal. They are known by different names like hors-d’oeuvre and appetizers. In Europe, they are called entrée. Having a good selection of starters can whet the appetite of your customers and thus excite them about what is in store for them as the meal progresses. The opposite can also be true. Having a bad starter or appetizer might ruin your customer’s appetite and can leave a very bad taste in their mouth (literally and figuratively). With that said, it is important to highlight your appetizers on your menu. You may also see french menu templates. 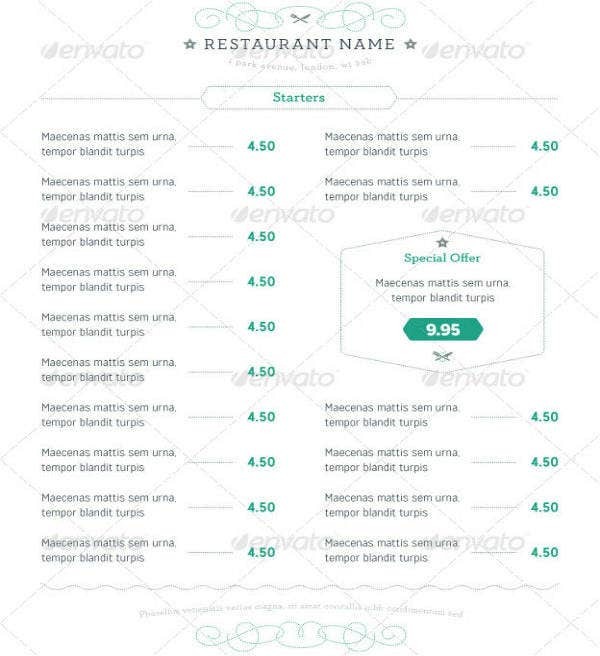 In this page, are templates for starter menus. These are fully customizable and will be of great help with creating your vintage restaurant menu. Bear in mind that you might need a few computer graphic and editing skills in customizing them though there are a lot of tutorials online to go around and learn. 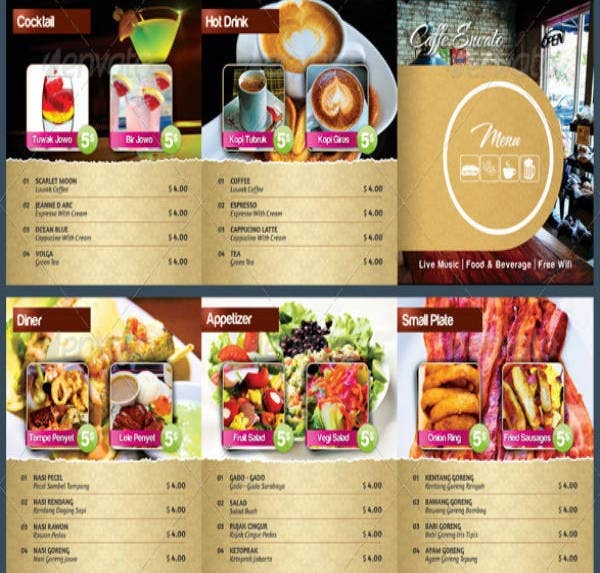 These templates can also be used for your other menu categories such as for beverages and for main course meals. 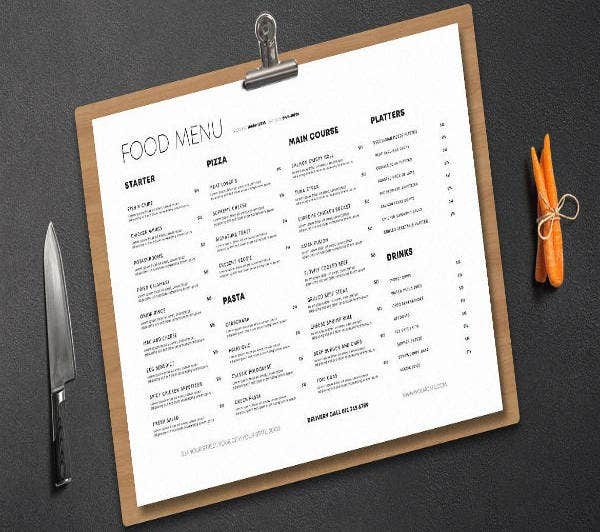 Find a good menu template that fits with the theme of your restaurant or what tickles your taste, download them and then customize accordingly. The kitchen is the head of the restaurant for obvious reasons. As such, the kitchen will tell how your menu will look like and what food is there. It is essential that the items in the menu can be consistently created in the kitchen. It would not do good for a restaurant to have a dish on the menu that is not always available. When creating a menu, take note of your kitchen size and the equipment in it. Having different stations in your kitchen can be beneficial to it. You may also see dinner menu templates. Having a soup station, pizza station, or a salad station means that when customers select those same items on your menu, they can be served consistently. Thus, it is important to have the adequate equipment for these stations and match them to your simple menu. How else is anybody going to serve a roast pig trempé dans la compote de pommes without a roasting section in your kitchen? If it’s in the menu, your customers will expect it to be available so always make sure that the link between your kitchen and your menu is totally solid. The menu is essentially your restaurant’s business card. With a quick glance, a customer can grasp what the restaurant is all about. 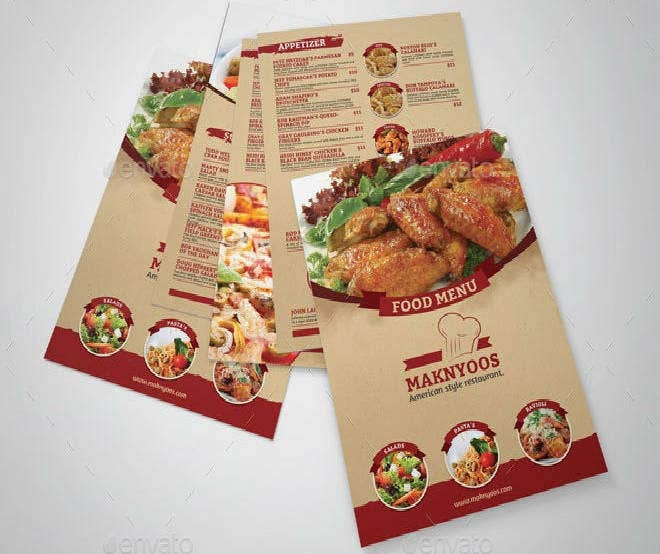 The menu is essential to communicate to the customer the theme, ambiance, and identity of a restaurant thus it is important to keep these things in mind when creating or selecting the design of the menu. It is no wonder that there are a lot of restaurant owners who outsource the creation of their restaurant’s men to professionals. However, not all can have that luxury, the templates found on this page can serve as the start of creating menus. 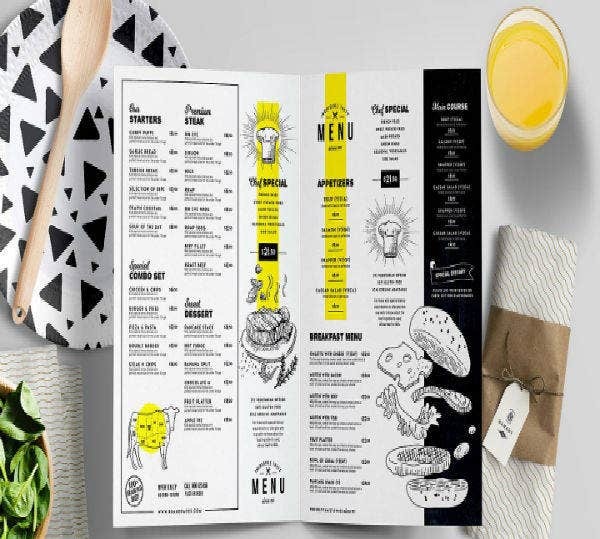 As a bonus here are some other design tips for crafting a good menu. The way people read a menu is akin to that of reading a book that is reading from left to right. Having knowledge of this can be advantageous in creating the menu as one would know where to place certain menu items on the menu for added noticeability and priority. Using eye magnets like different typography will help dictate a person’s eye patterns. 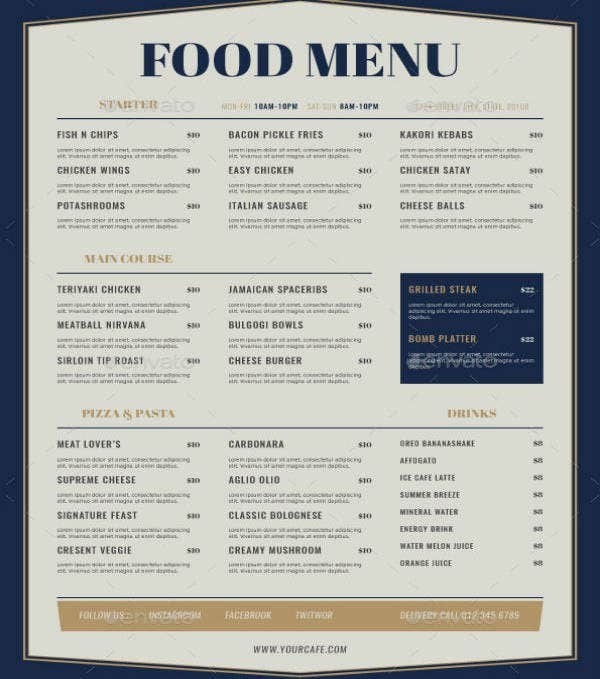 You may also see beautiful restaurant menu templates. Categorizing menu items are a great help to customers in their food selection. Using boxes to group your food items are an ingenious way of categorizing your menu items. In some cases, customers might just want to go ahead and just eat desserts after the appetizers and skipping the main course. Having them in a separated category will tell them where to go. This will be advantageous to your waiters as the customers will take less time in selecting their food and when they do, so will the kitchen staff, creating a faster service in the restaurant. You may also see free menu templates. In relation to eye scanning patterns, item placement is another important design element in creating a good menu. 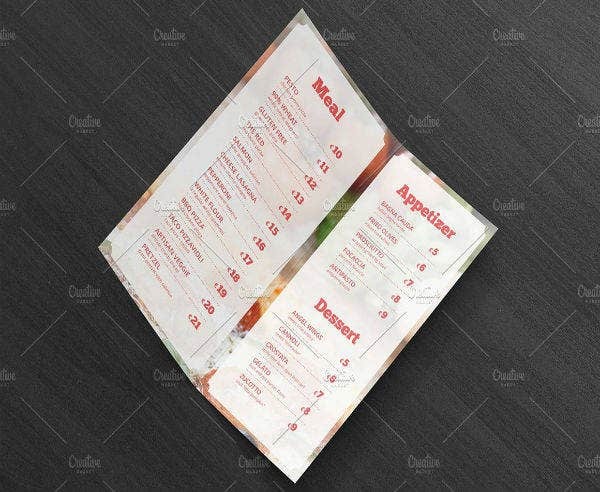 Menu items should be placed and arranged in a logical pattern. The dessert category should always be placed somewhere after the main dish and not before the starter. Emphasizing some menu items are great for the restaurant. Placing the best-sellers of the restaurant on the menu’s sweet spot where the eyes are drawn naturally will often make sure that the customers will order that food. Other ways to emphasize a menu item would be the use of proper typography and adding symbols or legends like a star. You may also see sample wedding menu. Items placed on the restaurant menu should be readable, legible and easy to understand. Pick a font style that does these things all at once. Also, do not stick to just one kind of typeface. As typography can help emphasize menu items, it is a good idea to pick a different typeface for a specialty item or for best sellers. 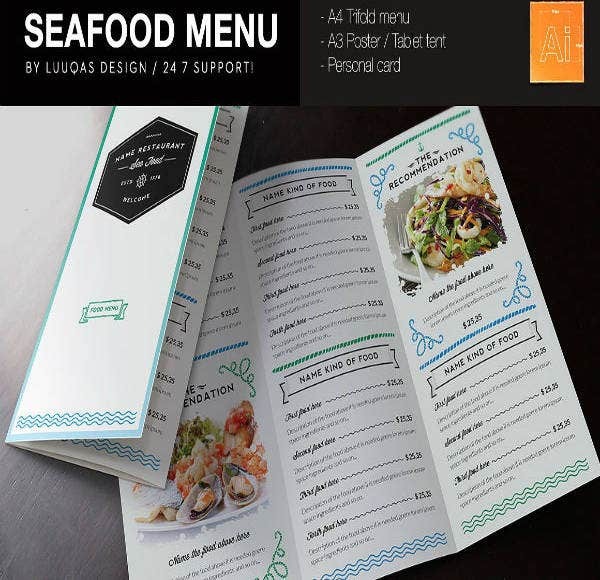 Lastly, make sure that it matches the overall design of the menu. You may also see watercolor menu designs. Customers tend to want to know what they are ordering. Food descriptions are the tools to do just that. A good description should tell not only what the food is made of, but it should also tell what feeling that food would want to convey. Descriptions that can evoke nostalgia for your patrons are a great help with food selection. Furthermore, the use of puffery on menu items is as old as menus. Puffery can change a normal sounding food into an exotic sounding one. You may also see Christmas menu templates. Food photography is a hard process and unless one is a professional food photographer, photos can make menu items less appetizing and more disgusting. Using photos can also be a waste of space for other menu items. It is a better practice to let customers imagine the way a food looks than to present them. Using illustrations that evoke imagination and hunger are better tools to spice up how the menu looks. The price list is the most difficult menu element to pin down. As a restaurant is still a business, its aim is to earn money aside from feeding people. When the price list is too obvious, the customers tend to focus on the price more and less on the food. A restaurant then has to make customers think more of the food and less on the money they spend and thus, it is often a bad idea to place food prices side by side. Placing food prices side by side can make it easy to compare prices. A good idea on how most menu designers do is to bury the price in the food description. This way, the food prices are as far away from each other as possible. 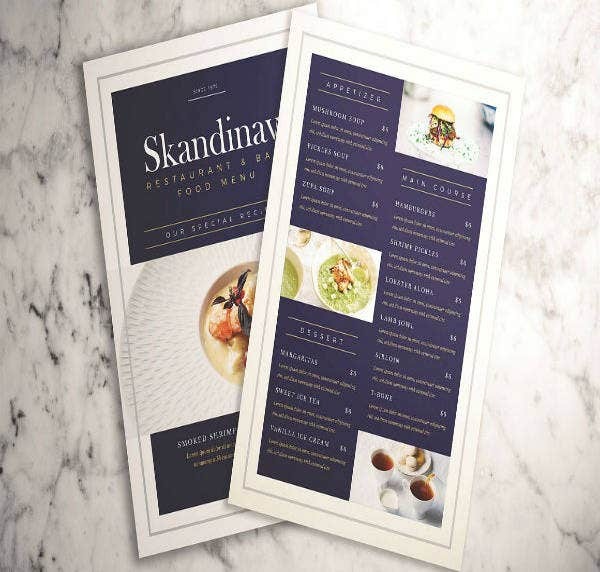 You may also see sample menu designs. As stated above, a restaurant should always make its customers think more about the food and less about the money. Currency symbols help people remember the price. Forget about them, rather find another way of pricing menu items. Using words instead of a number is a great idea for starters. Crafting a menu is hard work, but it is very well worth the effort. 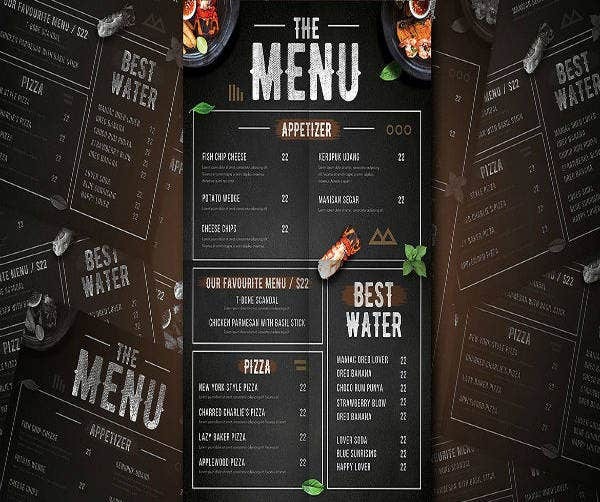 A good menu can lead to a good and profitable restaurant and as such, provided on this page are a few menu templates for use. The menu templates for this page are for starters, entrees, and appetizers, however, they can also be used for other menu items. Customize them accordingly and good luck on your menu. 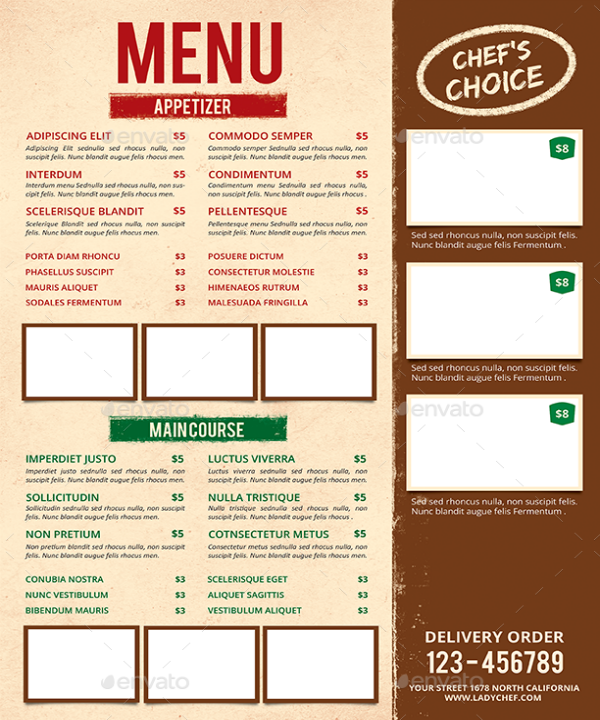 You may also see menu design templates.